Cultures from Europe to China have traditional days of the dead or ghost days that are thousands of years old that were part of the tribal folk religions before the advent of Christianity in Europe and Buddhism in Asia. Foreign teachers have introduced the British and American Halloween of October 31, but except for kids who have foreign teachers or the expat oriented bars and restaurants and schools in China, Halloween activities aren&apos;t popular in China. The Chinese have traditional days of the dead that are much more popular such as the Hungry Ghost Festival, the Qing Ming Festival, the Double 9th Festival, and the Spring Festival. 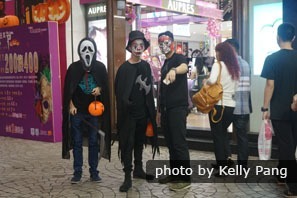 Halloween entered China mainly through two influences: foreign teachers and Western expats. Foreign teachers in China might have a Halloween party for their students and a lesson about Halloween in their country. So some Chinese children hear about Halloween and might make decorations and get Halloween candy. In general though, few Chinese do much about Halloween unless they have foreign friends. Halloween in China is a party day in expat-oriented bars and restaurants where a lot of expats live such as Beijing, Shanghai, and Guangzhou. The bars and restaurants frequented by foreigners will often decorate for the occasion with pictures of black cats, ghosts, and monsters, and Halloween lanterns, and there might be masquerade parties. In Hong Kong the two big theme parks, Ocean Park and Disneyland, have activities themed with Halloween. Masquerades, haunted houses, movies, and costumed people could give you a fright. In Shanghai there is an old building built in 1933 by the British called 1933 Shanghai that was a former slaughterhouse, and is now an chic office building, that holds a Halloween event every year with adult-rated masquerade parties. Halloween originated from the traditional holiday of Celts in Great Britain who believed that the last day of October was “the day of the dead” or “the ghost day” when ghosts crossed over the boundary between the living and the dead. It evolved into a day of fun and parties for most people. However, in English speaking countries such as America and Britain, many take the day seriously as a special day for religious prayers or witchcraft. The Chinese days of the dead are a part of the religion of the common people. A greater percentage of Chinese than Westerners really believe that on these days there is more of a bridge between the dead and the living, and so they must take precautions or honor the dead. These ghost days are a part of the folk religion of Chinese people called Daoism. These traditional festivals are hundreds of years old. In general, they are dates for people to protect themselves from attacks or pranks by the ghosts and also dates to seriously honor and worship their ancestors or famous people of the past. It is believed that the ghosts of dead people can help them or protect them. There are several days and a whole entire month in China that are similar to Halloween. These are the Hungry Ghost Festival, the Qing Ming Festival, the last day of the seventh lunar month, and the Spring Festival. The Hungry Ghost Festival: This ghost day is on the 15th day of the 7th lunar month. It is one of several important days to deal with ghosts and worship ancestors in China. The Taoist name for the Hungry Ghost Festival is the Zhongyuan Festival (中元节), and Buddhists call it the Yulanpen Festival. In many ways, this festival is reminiscent of Halloween or the Night of the Dead in the West. The seventh month of the Chinese lunar calendar is the scariest month of the year because on the first day of the seventh month, there is an ancient belief that ghosts are let out of hell. The seventh month is called the "Ghost Month" (鬼月 Gui Yue), and the whole month is said to be a month in which the ghosts are extant and traveling around the country, looking for entertainment. Many people try to avoid doing anything dangerous during the month, such as swimming or being out alone at night since the ghosts are active. It is thought that the ghosts may attack their enemies or be angry or malicious. The last day of the seventh lunar month: This is a less-celebrated festival day. It is thought that on the last day of the month the gates of hell are closed up again. People celebrate and observe this day in various ways. Many burn more paper money and clothing so that the ghosts can use them in their society in hell. In order to encourage the ghosts to leave, Taoist monks chant. 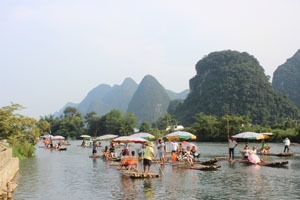 A common tradition is the floating of river lanterns that are thought to take or guide those ghosts back to their place. 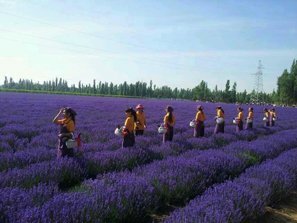 The Qing Ming Festival: This festival is in the spring on the 4th or 5th of April. It is also called tomb sweeping day. Families go out on the day to tend and repair their ancestors&apos; tombs. Many Chinese families maintain ancestral tombs. But you can see people out cutting the grass, decorating the tombs, and worshiping or presenting food. These are often like family outings. The Double Nine Festival: This is another traditional day for worshiping the dead. 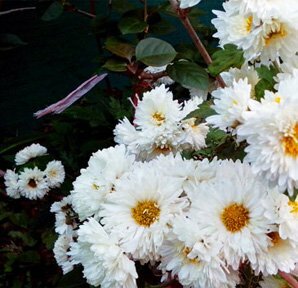 It is also a time for families to go for walks in the fall in the mountains and hills and drink chrysanthemum tea. The tea is healthful at this time of the year when the weather changes. 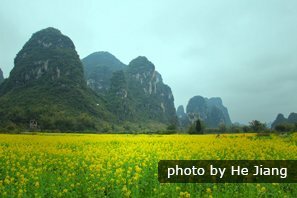 The Chinese Spring Festival: Every year, the Chinese celebrate the beginning of their new year with festivities, reunions, vacations, and fireworks. The fireworks originally were thought to drive away evil spirits, and there are a lot of Daoist religious traditions associated with the time that most Chinese probably still believe. Happy Halloween! 万圣节快乐！Wansheng Jie Kuaile!